According to the World Health Organization over 5% of the world’s population has some degree of hearing loss. Inner ear hair cell and auditory nerve damage, typically caused by noise exposure, ototoxic drugs, viral or bacterial infection, and aging accounts for more than 80% of all cases of hearing loss. Regeneration of these damaged hair cells has been considered by many to be the holy grail of treatment for individuals with cochlear hair loss, but this futuristic treatment has remained elusive. 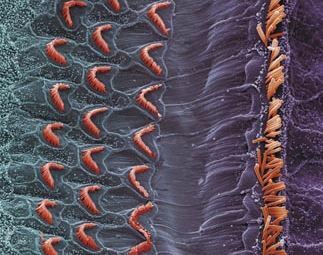 Recently, however, a group of scientists from Harvard Medical School and the Massachusetts Institute of Technology may have made a fundamental step in the use of cochlear hair cell replacement therapy as a viable treatment for some types of adventitious hearing loss. In a study published in the February 21st issue of Cell Reports, Will McLean and his colleagues demonstrated that Lgr5+ support cell markers, a cell protein that lines the intestine as well as other organs, could be regenerated into cochlear hair cells in a laboratory environment in mice. Using what is called a small-molecule approach, the researchers were able to take Lgr5+ organoids and grow & differentiate them into hair cells. The process, in which the production of daughter cells arises from a single cell, is referred to as clonal expansion. In this study the researchers were able to take the Lgr5+ supporting cells dissociated from the cochlear sensory epithelium and grow them into hair cells in high yields after treating the cells with a combination of growth factors and drugs. In the future, the ability to clone support cells into cochlear hair cells could lead to hearing loss treatments involving hair cell replacement therapies.